Trout fishing is a sport for everyone. You don't need a boat and motor, a depth locator, a pH meter, a guide, or any expensive tackle. All you need is a spinning or spin-casting outfit in working order, a box of hooks, some night crawlers and a pair of hip boots. (The hip boots are optional if you don't mind getting your feet wet. 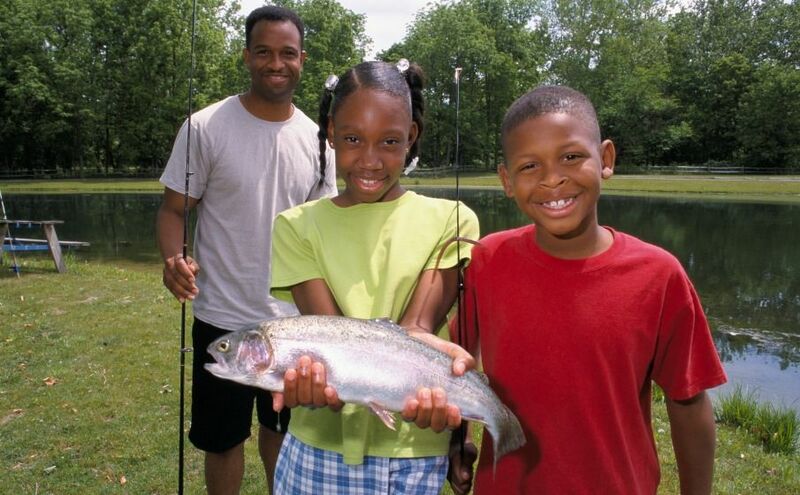 )If you are 16 or older, you will need a fishing license and trout stamp. These tactics will not make you an expert, but it may help you catch your first trout. From that point on you just need to go fishing and learn from your experiences. Brook trout (the only native of the three) thrive in smaller streams of good water quality, occupying pools and riffles that seem quite shallow when compared to the pools brown trout frequent. In-stream vegetation provides adequate cover for the brookie. They are very aggressive and relatively easy to catch. They normally are smaller than browns and rainbows, a 14-inch brook trout is a trophy. In large- and medium-size streams you will find them near the headwaters and in major springs. Brown trout (from Europe) are the most abundant and most sought after trout in southeast Minnesota streams. They are wary and must be stalked with patience. Your shadow on the water will "put them down" for an hour or two. They require overhanging cover like undercut banks or fallen trees. They will be found in the deepest pools, moving into the shallows (riffles) to feed in early morning and late afternoon. They feed actively on emergent insects like caddis flies and mayflies. Brown trout get larger than rainbows and brookies; 14- to 18-inch fish are common and browns more than 25 inches have been taken in the southeast. Get a map of the area you are going to fish and make sure that you are actually fishing in trout water. Use monofilament line no heavier than 6-pound-test in cloudy or muddy water and no heavier than 4-pound-test in clear water. HARDWARE: Spinners, jigs and other minnow imitators also work well for trout. Any color or style is apt to work, but match these colors and species for starters: gold for browns, silver for rainbows and copper for the brookies. When casting hardware you don't have to worry about an unnatural drift. Minnows swim in all directions. You still must make a cautious approach to the pool. A favorite strategy is to bait fish a stream, working your way upstream, and then cast spinners to the same pools on the way back.